One thing I appreciate about VSB is how it provides a safe space to hate on things that other people enjoy. Take, for example, Damon Young’s total disdain for small talk or my screed on why spades at game nights should be banned. There was also the time I proclaimed that DJs should stop playing Montell Jordan’s “This Is How We Do It” at a party, a position by which I still stand. So it is with great pleasure that I share with all of you the latest desire of my ire: ugly-sweater Christmas parties. This tradition, much like our president, has got to go. If someone invites me to another ugly-sweater Christmas party, I will show up to that person’s party with a picture of their mom on my sweater. I’m sick of ugly-sweater Christmas parties, and you should be, too. No one ever leaves an ugly-sweater Christmas party talking about other people’s sweaters; they talk about the jokes and the laughs that were had. What value does an ugly sweater add to this? Nothing. What void exists at a holiday party that an ugly sweater can fill? If a party is good, there should be no void to be filled. My attitude about ugly-sweater Christmas parties wasn’t always this way. My first ugly-sweater Christmas party was about five years ago. At the time, I thought it was a pretty good idea; nothing wrong with wanting to put a twist on the timeless Christmas-party tradition. So I went and I had a good time. We all may have made one or two remarks about each other’s ugly-sweater choices, and then proceeded not to care that everyone looked ridiculous. But the following year, I received more invites to ugly-sweater Christmas parties. I was more than willing to go to the one I attended the year before, but four or five ugly-sweater Christmas parties? It was getting out of hand and I realized why: Instagram. As soon as I saw ugly Christmas sweaters stitched with images of Drake wearing an ugly sweater, I knew we had jumped the reindeer. The more creatively ugly a sweater can be, the more likes a person thinks they’re going to get. 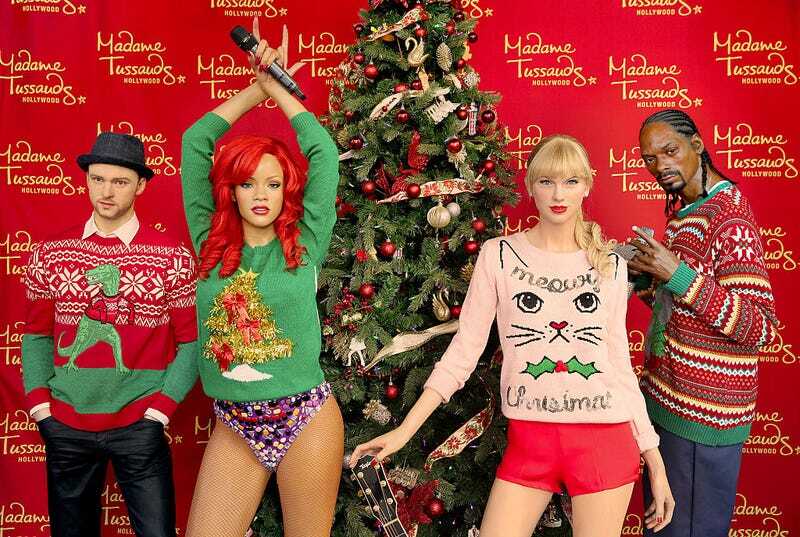 This is why I don’t like anyone’s picture of them wearing an ugly sweater, even if said sweater has my face on it. At this point, it’s practically become another Halloween, and I love Halloween. I’m actually the type of guy who has at least two or three costumes planned out for all the various Halloween parties I attend. But you know the kind of guy I will never become? The guy who buys a new ugly sweater ironically every year to attend an ugly-sweater Christmas party. The other issue I have with ugly-sweater Christmas parties is, damn, aren’t y’all hot? I don’t know why it is that the uglier the Christmas sweater, the itchier and hotter it has to be, but this seems to be the case. Then, when we arrive, the party is usually packed, a DJ is playing music that makes us want to dance, and the only thing there to drink is that spiked hot chocolate and room temperature coquito or eggnog. Two drinks in, and we’re singing Donny Hathaway’s “This Christmas” at the top of our lungs (because we always have to run that classic back), looking like sweat-drenched gingerbread people who need some air. In spite of my growing resentment of ugly-sweater Christmas parties, I will show up to one if invited—only I will be showing up in normal clothes (maybe a Santa hat), because the best thing about any holiday party, regardless of the theme, is the actual party. Holiday parties are especially fun when you’re an adult. We get to do things like eat a bunch of Christmas cookies, only now, instead of dipping them in milk, we get to dip them in whiskey and we get to spike the hot chocolate. Everything about holiday parties has always been so perfect, why do we need to attend one looking ridiculous and unoriginal? It is time for us to take back the holiday party from what has become a sad, uncomfortable commercialization of the holiday season. This year, instead of an ugly-sweater Christmas party, go for something else, like a regular Christmas party. Because they’re fun and they don’t irritate the skin.